At the rear of the Panteón Municipál, the city cemetery in San Miguel de Allende, Mexico, is a columbarium, the wall of nichos where the urns of ashes of those cremated are interred. It holds memories and tells stories. It also tells us about cultural differences and ideas about life and death. 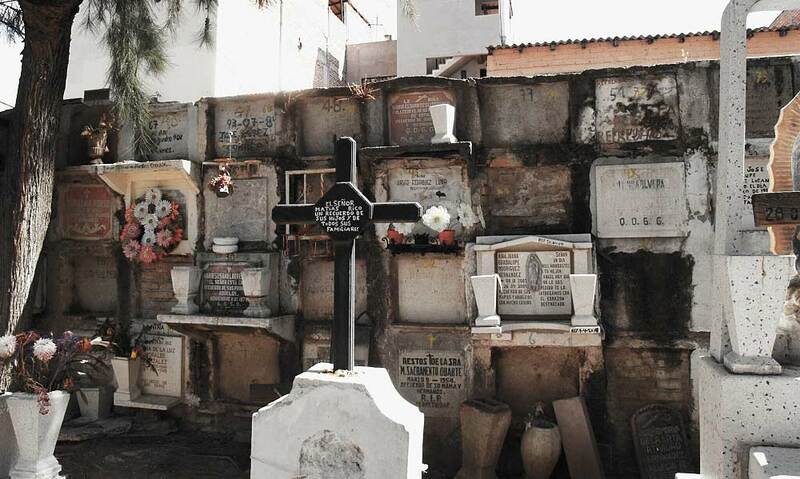 — a glimpse of a typical Mexican cemetery in San Miguel de Allende, Guanajuato. I like Mexican cemeteries. To me, they seem very real and very human. They are not sterile, tidy places. They are not manicured. They are certainly not uniform. They are a reflection of the life that came before them, the untidy lives lived by the people that now inhabit—and perhaps haunt—them. They are not like the cemetery in southern California where my mother lies buried. It is one of those “Green Hills” type places, the kind they don’t even call a cemetery anymore. It’s a “Memorial Park” or something like that and looks more like a golf course. Like no one is buried there. 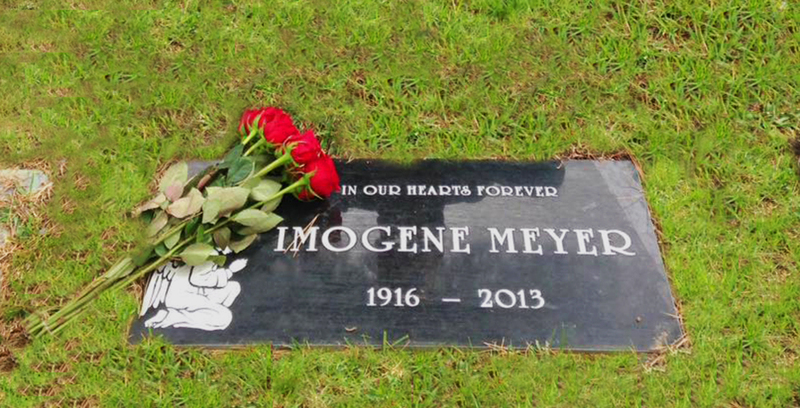 You are not allowed to have an actual gravestone in such a place. Nope. No monuments or statues or mausoleums. None of these overdone, over-wrought tombs with weeping Victorian angels like the ones that adorn and beckon from the cemeteries we love to visit on our travels, cemeteries like the lovely Pére Lachaise in Paris or Highgate Cemetery in London. No, these “memorial park” pseudo-golf courses allow only a simple plaque marking the plot where love now resides. A stone or metal rectangle, flush with the manicured lawn. No headstone or tomb or even a cross is allowed to break the clean, un-dead line of the rolling hills of grass. But Mexican cemeteries! Ahhh, now here we have signs aplenty of the actual people behind the graves, both living and dead. The Mexican graveyards I know and love are much like life in this rich and colorful country—varied and many, often untidy, frequently haphazard, exuberant and overdone. Ranging from the professionally correct to the lovingly hand-crafted. Seldom perfect but invariably heartfelt. There are large and fine mausoleums housing whole families with carved marble columns and weeping angels aplenty. They sit next to roughly hewn crosses with hand-painted remembrances. There are live flowers, in full flush or wilted, but they are usually outnumbered by an overabundance of plastic posies, frequently red, often faded to old-lady dusty rose. At the back of the Panteón Municipál, the cemetery in San Miguel de Allende, in the Mexican state of Guanajuato, is the columbarium, a wall of small nichos where the urns or boxes of ashes of those who have been cremated are placed. Each nicho has its plaque, its shelf for vases of flowers or perhaps a candle. But except for their square size, the nichos’ only uniformity is their lack of sameness. Some are bricked up. Others have rather plain cement slab fronts. Some have marble, others stone. Some are white, others pink; some have the names and dates carved, others are written by an unsteady hand. The creators of my mother’s cemetery would, ahem, be turning in their graves at the untidiness of it all. But to me, the cemetery in San Miguel de Allende is a far more inviting place, despite the fact that at my age I have way too many friends now silently residing there. It is vivid… in the true sense of that word. It reflects life rather than death. It is vibrant with the whole mess of human feelings and actions and levels of being. At my mother’s “memorial park,” every one of those dead souls, who was so much a vibrant being full of individual tastes and feelings and favorites and hates and loves, is reduced to the exact same-sized plaque in a rectangle of pesticide-fed lawn, all marching in lockstep down the rolling hillsides of the “park” at the precise same distance apart. When I visit an American “memorial park,” I never hear music in my head. The only notes I might hear would be the somber hymn of a funeral in progress under a tent canopy on the next rolling hillside over. But in a Mexican graveyard, I always fancy I hear music, even when the place is empty. It might be the Cucurrrrucucu of “La Paloma Triste” or the weeping notes of “La Llorona.” Or maybe I just hear the small voice of a child singing “Las Mañanitas,” the birthday song. But it is always there, just below the surface. During the night of Dia de los Muertos in San Miguel de Allende, the music rises up and becomes real. For days beforehand, the cemetery in San Miguel, like those across the country, is cleaned and weeded, the graves scrubbed and painted. Flowers, especially cempazúchitl, the Mexican marigold, are carried in by the armload. Candles, sugar skulls, gold paper decorations, and other items are brought in to decorate the graves. Yes, Dia de los Muertos, Day of the Dead, is one of the best times to visit San Miguel de Allende. For me, the choice is pretty clear. Unless you can sprinkle me over a mountain top or throw me wildly to the wind and the waves, I’ll take the messy but vivid life and fullness of a Mexican cemetery over the tidy uniformity and dullness of a Stateside “Memorial Park.” Just bury my heart in the cemetery in San Miguel de Allende. So lovely and evocative. I’ve visited Mexican cemeteries closer to the border, in Mexicali and Tijuana. The Day of the Dead is glorious and I love the families hanging out with their departed relatives, the sullen but present teenagers, the little ones playing, the men drinking. Music too. I won’t forget the pick up truck, radio blaring, as funeral guests arrived. I’m all for a nice urn somewhere but will most likely choose ashes scattered at sea. My waterlogged spirit so loves diving. You describe it well, Elaine. You’ve captured that special magic that is Day of the Dead in a Mexican graveyard! And quite honestly, I will most likely choose the ocean as well, like my dad did. Very touching post. I’ve visited the cemetery in Buenos Aires which may be similar to the Mexican traditional cemetery. The only thing I didn’t like too much is that the poor and the rich get segregated even on the cemetery. Otherwise I understand your point. Yes, I have seen some cemeteries here like that, but the one in San Miguel is not segregated by rich and poor. However, one thing I DO dislike is that there is a “gringo section” of the cemetery. It was purchased by a local ex-pat pre-paid burial society. It is very pretty and well-maintained, but I hate that there is a separate section for “us” vs. “them.” It just feels wrong. Your piece recalls another difference. The difference between manicured, weedless lawns in the US and the use of the ground around a chalet in Switzerland to grow hay for animal consumption. Which is more part of the cycle of life? And better use of resources? You make a good point, Janet. Also,I have seen stories about some US communities where people tried to use their front yards to grow fruits and vegetables instead of lawns only to be told by either the city or their local HomeOwners’ Association that they were not allowed to do it, that they HAD to put in manicured, pesticide riddled lawns. Screwed priorities, methinks! Awwww, thank you so much, Carole. And you are a supportive friend!